On Saturday, May 11, 2019 at 2:00 p.m., Nyack College and Alliance Theological Seminary (ATS) will hold its 136th Commencement Ceremony at the Westchester County Center located at 198 Central Avenue in White Plains, NY. Ms. Tyson is an iconic actress known for her portrayal of extraordinary female characters on stage, in film and television for the past six decades. Those roles include the character Binta, mother of Kunta Kinte, in the 1970s miniseries “Roots” and the lead in “The Autobiography of Miss Jane Pittman,” for which she received a double Emmy for “Best Lead Actress in a Drama” as well as a special Emmy Award for “Actress of the Year.” More recently she was Emmy-nominated in 2015, 2017 and 2018 for her recurring appearance as Ophelia in ABC’s “How to Get Away With Murder.” Other accolades include her multiple NAACP Image Awards, Kennedy Center Honors, the Presidential Medal of Freedom and a star on the Hollywood Walk of Fame. Ms. Tyson is the guiding force behind the Cicely L. Tyson Community School of Performing and Fine Arts in East Orange, New Jersey that serves some 1,200 K-12 students. Since 2014, Mrs. Hoogstra has served as the seventh president of the Council for Christian Colleges & Universities, a Washington, D.C.-based association that advocates for the integration of faith and learning. In addition to her 15 years in the role of vice president for student life at her alma mater, Calvin College, Mrs. Hoogstra spent more than a decade as a law firm partner specializing in litigation. She has served on the boards of several community organizations and schools, as well as the New Haven County Bar Association. Mr. McCarter is the founder of Community Renewal International (CRI), which is a model for reconstructing the foundation and infrastructure of society through a system of loving relationships. Twenty-five years since its inception, there are over 50,000 CRI workers called “We Care” team members across the U.S. and in 41 nations globally assuring that children of all ages live in a world that is safe and loving. Mr. McCarter has been honored as “Social Entrepreneur of the Year” by The Manhattan Institute, “Distinguished Alumnus of the Year” by Texas Christian University, “Distinguished Minister of the Year” by Brite Divinity School, and “National Citizen of the Year” by the National Conference on Citizenship. 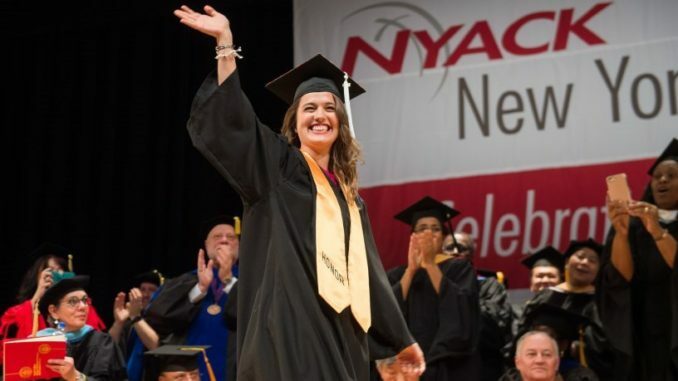 Learn more information about Nyack’s Commencement Week.